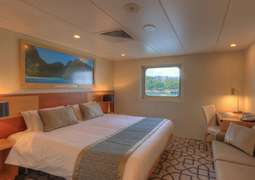 Since 2005, the Coral Discoverer has been exploring the best of the South Pacific and Australia. Make your own discoveries as this incredible ship takes you to wonderful destinations in the utmost of comfort. 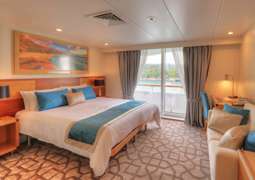 On board the Coral Discoverer there are a number of tastefully and lavishly decorated cabins which give you the most comfortable seafaring life on the high seas. Enjoy modern amenities such as en suite bathroom, storage space, air conditioning and comfortable beds. Aboard the ship you can enjoy great meals in the dining room which features tasteful furnishings and an intimate setting where you can get to know other passengers. Look forward to the Zodiac excursion boats which take you to remote locations and allow you to experience the natural beauty of the region up close and personal. As well as the Zodiacs there is Xplorer which is a special excursion vessel which allows all guests on board to visit the best of the regions visited by the Coral Discoverer. Go out onto the sun deck and have a swim in the pool, making the most of the good weather. Keep in touch with people back home with wireless internet and upload pictures of your trip while you are on the ship! Relax away from everyone else in the library on board, or have a more wild time at the cocktail bars in the evenings. There is an open bridge so you can interact with the captain on a personal basis and visit the gift shop to get souvenirs for yourself and for loved ones back home. If you are a keen swimmer then make sure you go scuba diving, and there is much to see underwater so it is well worth a try!